Recommended to: Readers looking for a new twist on the angels in their reading. Gabriella's past is a mystery, but that never stopped her from achieving her goals. As a supernatural specialist, and far more intelligent than anyone her age, she has always been ignored by her peers. Because of the isolation she has always felt, she put her life and soul into her job. Being a supernatural specialist hasn't given her the divine intervention she always longed for, until one day a shipment arrives from Italy containing three dead bodies with an uncanny ability to regenerate. Gabriella is frightened and intrigued, but not as scared as she becomes when a dark creature attacks her. As the bodies come back to life, the plot takes an unexpected twist that you won't see coming. The supernatural world only begins to unfold before her as angels appear, her dreams start to haunt her, and the very past she has forgotten comes back with startling clarity. Romance blooms, escape plans are made, an assassin is out to kill her, and death is only around the corner. But what is more terrifying than all of it is the fact she is the chosen one, the Illuminator, the one who will save them all. In an effort not to make this review long winded (yes I know some of mine can get that way) I'll get straight to the point here. This book is extremely original and very interesting! Laura Kreitzer writes angels in a way that I haven't seen before. They have depth, they have substance, they have golden tears people. Golden tears. I'm not exaggerating when I say that it was the angels in the book that really drove the story home for me. I fell in love with them even more than I did the main character, Gabriella. Indeed, I applaud Laura for her character building skills! Gabriella was also a very well written and interesting character to follow. You could feel her emotions rolling off the pages. I also loved how dedicated she was to her work, and how she was written to dissect every little thing that happened. As a person who has a father in the medical field, I know that people like Gabriella love to weigh options. They take every possible outcome and then make a decision! Watching her navigate the choices thrown at her was fascinating. Now on to the reason I had such a hard time deciding how to rate this book. Truth be told, there are portions of this book that are extremely long winded. Entire sections of the story were so dialogue heavy that the book feels a little weighed down at times. If you'll look above at the page count, this book is truly a behemoth. It was the biggest book out of the last 5 books (all 400+ pages) that I've read. I've never minded a long book, and still don't, but the story needs to be moving along at a nice pace to keep me invested. This, and only this, is why I had such a hard time rating this book. 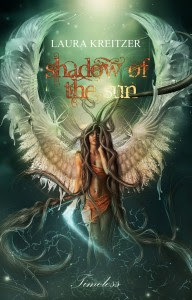 To sum things up, I think Shadow of the Sun has an extremely interesting premise and is a solid story overall! I'm hoping that since this is the first book, and therefore had to set everything up, the sequel will add more storyline and move a little quicker. We all know opening novels can be tricky! I loved the ending, and I look forward to the next installment.